This course is open to any person interested in learning solid basics and principles in the Art of perfume-making as an Introduction and Foundation. It is also an excellent course for people already working in fragrances retail, marketing or copywriting and who would like to gain a better knowledge of how perfumes are made. It allows you to check whether perfumery trade is for you before you decide to take it further. This course is not for hobbyists. ​SEE INFORMATION ABOUT YORK ACCOMMODATION. Course location: Blake House, Blake Street, York, YO1 8QH, U.K. Participants working in the fragrance retail, marketing or bloggers, journalists, media & advertising executives related to the perfume industry. ​Please note that this course is not suitable for hobbyists. 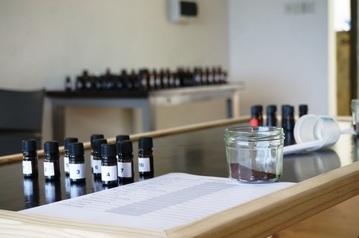 ​​This course is open to any person interested in learning solid basics and principles in the Art of perfume-making as an Introduction and Foundation. It is also an excellent course for people already working in fragrances retail, marketing or copywriting and who would like to gain a better knowledge of how perfumes are made. It allows you to check whether perfumery trade is for you before you decide to take it further. ​The course fee includes all materials and accessories and refreshments/snacks during the breaks. It does not include accommodation and meals. Please note that when joining this workshop, you will benefit from a discount of 10% off if you decide to enrol to our Certificate in Perfumery Art or Diploma in Art of perfumery online programs. When joining our course programmes, you accept our Terms and Conditions. Payments in USD or EUR will be converted to the ongoing currency rate from GBP. If you choose to pay by instalments with PAYPAL when that option is available and you are a holder a Private Paypal account with limits, we advise you to subscribe using your credit card and not your Paypal account in order to avoid failure of the next instalment. If you are not a holder of a Paypal account, choose the Credit card payment option. PLEASE NOTE THAT YOUR REGISTRATION WILL ONLY BE COMPLETED AND FULLY ACCEPTED UPON FULL RECEIPT OF THE PAYMENT PRIOR TO THE COURSE START DATE. You may transfer your course booking to any person of your choice (except if the course is for our students only) provided you notify us in writing, including the name, address and contact details of the beneficiary. The school reserves the right to cancel any of the scheduled sessions or training courses if the minimum of 5 participants has not been met. Notification will be given in advance and participants will be offered the opportunity to get a refund or reschedule to a later date. It is strongly recommended to subscribe to a travel/transport insurance in case of an event preventing you or the school from going ahead with any workshop. It is advised to choose any accommodation booked in the area of the venue with a cancellation option to prevent any loss in case of cancellation of the workshop or course due to unforeseen circumstances whether on your part or the school's part. In case of cancellation, please ensure that notification is given to us within the cancellation time frame stated above and that you understand our Terms and conditions and policies for cancellation. In case of cancellation of the course or workshop by the school, the refund only relates to the course fees paid in advance. The School shall not be made liable for any expenses or damages incurred due to late notice of cancellation or to cancellation by the school. The School will give priority to newly enrolled participants and will be under no obligation to propose an alternative date to the participant having cancelled and it will only do so at its own discretion and if any place becomes available at the last minute. For residential workshops, the alternative date will only relate to the course itself in case of cancellation on the participant's part. Any fees paid in advance for the accommodation and meals will be retained. Should the residential workshop be cancelled by the school, fees will be refunded for the course. Fees for accommodation and meals will be refunded according to the cancellation policies of the residential venue. These terms and conditions are described in the course brochure sent to participants no later than 2 months prior to the starting date. We strongly advise that you subscribe to a Travel and/or Medical insurance when you join one of our residential courses or field trips. In some instances, travel and medical insurance will be required prior to accepting your participation.